Kedah is a state in northwest Malaysia, bordering Thailand. And Langkawi is an island within that state. Langkawi Island is called “The Jewel of Kedah” for the beauty it owns. I was in Langkawi this January after an extended Christmas and New Year week celebration. There is a lot about Langkawi that I want to write, so yeah! I will try to keep myself as organized as possible. Starting from a beautiful morning when I landed in Langkawi. During that entire journey from the airport to my stay, peeping out of the cab’s window, I could feel the chilling breeze and the freshness of Malay. Maybe he was supposed to cook. Not troubling him much I ordered bread butter toast with coffee, but Michael somehow decided to trouble him and asked for chicken fried rice at 9 am in the morning. Though Michael was busy enjoying uncle’s open space, I was constantly worried whether uncle would be able to cook alone or not. Not taking much time he came outside his kitchen with the toast, coffee, and fried rice. I still remember that huge smile on Michael’s face to eat the fresh fried rice after a very very very long time. “This is amazing Erica; we will come here for dinner also.” I said, “okay.” Uncle Johnny is amazing. We made a new friend early in the morning. 🙂 I was glad to see that people are happy with whatever they do, even a 70-year-old man can run a cafe and cook so well because it is his happiness. And of course, a meal for two that cost MYR 18 is not at all bad for budget travelers like us. Uncle Johnny also recommended us a scooty renter. According to his recommendation, we rented a scooty for four days which cost us MYR 30 per day. I thought Malaysian scooty’s are different but no, not really. 😛 I rode the scooty till the petrol pump. Since India has hired employees to fill the petrol at the station, it was really fascinating for me to fill the petrol in my scooty on my own. Michael made a troll of my excited face (he does that every time). We then explored a bit of our nearby area and went back to our place to take some rest. Wow! I like riding scooty. 😀 The next day we reached the most famous spot of Langkawi, the cable car going to the SkyBridge. The oriental village is the common area from where we can go for multiple experiences. The most famous is the Langkawi SkyBridge, then there is SkyDome, SkyRex, 3D Art Langkawi, Time Travel & 6D CineMotion. We bought a combo ticket which included cable car to the bridge, SkyDome, SkyRex, and 3D Art Langkawi. We first went for the cable car ride which has two segments. The first trip is from the start point to the famous viewpoint that is above the SkyBridge and the second trip is going down from the viewpoint to the SkyBridge. When we reached our first stop point, the view space, there were many monkeys to welcome us. I could see a little girl crying on the top of her voice because one of those monkeys just snatched her biscuits. Anyways it was a place with a fantastic view. I could see the SkyBridge, the mountains, the water and the entire Langkawi from that top. After spending some time there, we went for the next sky cab ride to the SkyBridge. From the spot where the cable car drops us, we can take the paid express lane (another sky cab), or we can walk for free. 😛 We chose the 10 minutes walk to the bridge. And here was the 125-metre long curved pedestrian cable-stayed Langkawi SkyBridge. ALSO READ: TEN BEST THINGS TO DO IN KUALA LUMPUR, MALAYSIA. Breathtaking I must say, especially when you are at that point of the bridge which has the glass floor and you can actually see what height are you standing. Can I repeat it? BREATHTAKING! Of course, we took a lot, a lot and a lot of pictures. And at the other end of the bridge, there was a quiet, calm place where you can sit and enjoy the view. Finally reaching our last spot, the Langkawi 3D art museum, we saw something really fascinating. The amazing 3D paintings on every wall of the entire area was really cool. I think pictures will explain well here……. While riding back to our stay, I and Michael were looking for the waterfall we had seen from the cable car. Since we couldn’t find the exact location and it was late in the evening, we decided to get back home. The next day, after coming back from our jet ski tour we visited that waterfall, Seven wells. We parked our scooty, and we had to walk around 1 km uphill to reach the place. There it was, a relaxing waterfall. Though I slipped twice while climbing up the rocks, I enjoyed that heavy water flow on my head. SOOTHING, I should say. The same night, after returning from the waterfall, we went to the most famous beach of Langkawi, the Cenang beach. Cenang is a very happening place with lots of local shops and duty-free shopping areas. You can find a lot of inexpensive things to take back home. I bought few chocolates and some alcohol at a meager price. 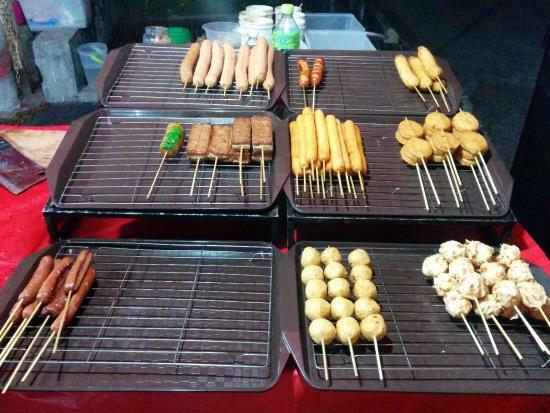 You will find some amazing authentic Malay street food like crab, fish and prawn sticks, sausages, chicken and much more. Ohh! You cannot walk off without trying the mandatory NASI LEMAK, the authentic Malay food. You will find Nasi Lemak everywhere at a very low price MYR 8 – MYR 10, that’s nearly $2.5 – $2.8. It’s Malay chicken curry with rice, and it tastes heavenly; Please don’t ever leave Malaysia without trying it. I also bought a traveling bag, few shirts and some fridge magnets of course! The vibrant market forced me to go for never-ending shopping, but I had to stick to my budget. Coming to the beach area, Cenang has a lot of shacks where you can sit and chill enjoying the cool breeze and just go for a long walk; it will refresh your mind completely. I could also see a lot of Spas at Cenang which offers you a complete body massage to get you more relaxed. At the market, you will also find many tour operators offering various water sports at a very feasible price, Out of scuba diving, boat ride, fishing trip, snorkeling, we chose Island hopping Jet Ski tour. Damn! It sounded fun, and so it was.